The investigation by Animal Services after a dog bit a young girl in the face was riddled with problems, according to Toronto's ombudsman. In her annual report, Toronto's city ombudsman Fiona Crean wrote about an attack so alarming it prompted her to recommend changes to Animal Services. Crean investigated after Anna Maria Mountfort contacted her last year and in a report released Thursday concluded the family was "not well served following the bite." Mountfort's daughter was attacked by a German shepherd-collie mix that a friend of theirs was dog-sitting in 2012. The dog lunged at six-year-old Audrey while she was playing in the friend's backyard with her sister, with an adult supervising. The attack left Audrey needing 40 stitches. Mountfort heard the screams and ran outside. She remembered, "I was holding her face together. Trying to staunch the bleeding, to figure out what happened." The Trinity Bellwoods resident reported the bite to Toronto Animal Services but said the agency didn't do a full investigation. According to Mountfort, the agency didn't interview her family and it took three weeks to get an order to muzzle the dog, which was later lifted. She said the city needs stronger laws to deal with dogs that bite. The dog's owners were contacted by CBC for comment, but declined, citing an ongoing civil case filed by Mountfort to have the animal destroyed. "In some cities you cannot own a dangerous or vicious dog without a special licence, without taking special measures like muzzling in public, or without carrying special insurance," Mountfort told CBC News. "The process was really botched," Crean told CBC News. A summary of her investigation cited interactions with the agency that were "fraught with excessive delay." She also noted "a lack of clarity about the process." "There was delay, there was conflict of interest, inappropriate comments made by the investigator, poor record keeping. The muzzle order on the dog was lifted by public health," she said. Crean's report made six recommendations to address those issues in July 2014. Elizabeth Glibbery, a manager at Toronto Animal Services, said most of the recommendations have been implemented, including a 24-hour response time to investigate dog bites. Before Mountfort's experience, investigators had up to five days to respond to reports of a dog bite. Still, Licensing and Standards Committee member Counc. Glenn De Baeremaeker said Toronto Animal Services is limited in what it can do when there are complaints. For example, he said the city can't impound the dog after it attacks someone. Enforcement is also a challenge, he said. "We cannot have a police officer or an enforcement officer at every single park or every single ward and every single part of the city because it would cost us hundreds of millions of dollars." 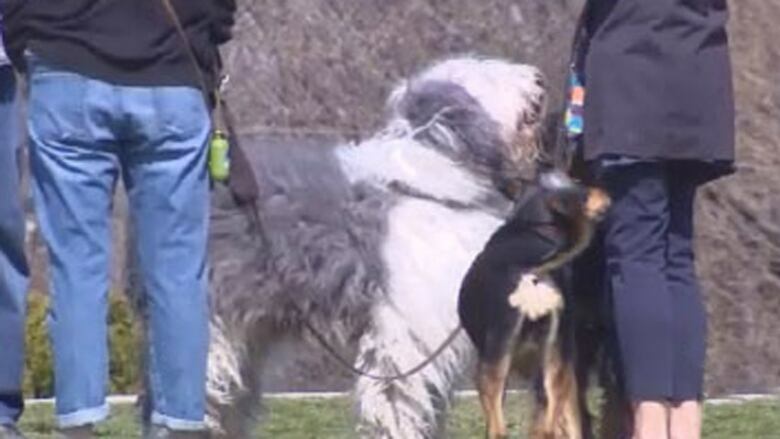 CBC was at Trinity Bellwoods Park for about 30 minutes on Wednesday and routinely noticed dogs off leash in areas where that's prohibited. De Baeremaeker said dog owners need to be responsible and follow rules. Toronto Animal Services will also present a report on dangerous dogs to the Licensing and Standards Committee this summer.